Composites in Manufacturing talks to Graeme Bond, technical director at FDM Digital – a leading UK contract, additive manufacturing provider – about how 3D printing is beginning to make significant inroads in the composite industry. In F1, automotive and aerospace, additive manufacturing has already moved beyond prototyping and is being used to print production parts. And whilst it’s been on the scene for several years now, for those who are still unsure, can you give us a layman’s explanation of what it is? “3D printing or additive layer manufacturing as it’s also known, is a process by which a 3D object is grown from literally nothing by continually building or fusing a material layer on layer forming the part created digitally in a 3D CAD design package,” Bond begins. So why is 3D printing growing in popularity in the composites industry? “We’ve worked with several F1 teams and top motorsport companies to help develop soluble tooling solutions. We’ve designed complex ducting, panels and pipes using SR30 soluble core technology. Can you explain what soluble core technology is and the process involved? “Soluble core is a filament material designed to be dissolved which makes it perfect for carbon wrap applications. However, adding FDM Digital’s engineering input this is now also being extracted with certain types of 3D geometry. “First you build a 3D printed surface finished mandrel upon which carbon fibre can be laid. The carbon and core are then autoclaved curing the product on the mandrel but then by dissolving or extracting the core in a secondary operation this leaves the hollow composite final component. Is the technology migrating across other sectors? “We are seeing a natural progression from the fast paced F1 world into the aerospace supply chain which will change the manufacturing thought process for current and future aircraft programmes. 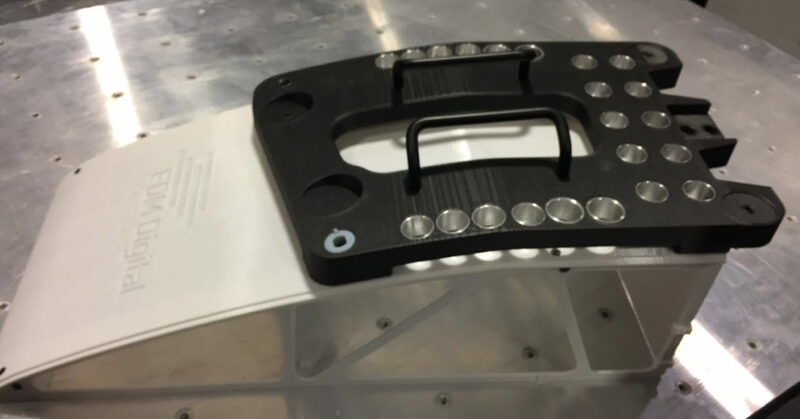 Bond illustrates 3D printing’s cost-saving benefits by citing a recent carbon tooling project FDM worked on for an aerospace customer. Bond is justifiably proud of this project. Customer feedback has been excellent and it’s estimated the 3D printed part has saved them £20,000 per year in concession repairs, plus it’s addressed the health and safety concerns too. You’ve touched on using 3D printing for aerospace tooling, but how about actual flight parts? “3D printing is being used more widely in the aerospace industry, but again I think the full potential is yet to be realised. By their very nature, aircraft assemblies are complex in design but 3D printing gives designers the freedom they need to create intricate 3D geometric components that would otherwise not be possible to manufacture by traditional methods due to tooling design limitations. Furthermore, 3D printing can produce low production volume customisable parts that typically weigh considerably less than their traditionally produced counterparts. For aerospace this is big news as weight saving is fuel saving. So, is 3D printing set to take over the composites world? Bond is certainly putting his money where his mouth is. Formed in 2012 backed by Mercia Technologies and Rosebud, FDM Digital claims to have the largest commercially available 3D printing capacity in the UK combined with the largest build envelopes on the FDM Process. The Burnley-based company, boasts nine Stratasys machines and has recently invested in a cutting-edge HP Multi Jet Fusion machine – the only one in the UK commercially available specifically targeting the aerospace, automotive and F1 sectors. So as new 3D printing technology and future materials begin to integrate and emerge from prototyping into true additive manufacturing and take on an even greater role in printing low volume composite parts, the potential for the composites and additive manufacturing industry is huge.